Today is Andy's birthday. We drove down to St. Louis last weekend to meet Margaret Clare Griffin (Meg) and celebrate a week early with Catherine's fabulous cake. Lulu (Louise Catherine Griffin) had a great time at her swimming class with her Dad and Poppa. Catherine got to take her first walk while Momo stayed with Meg. Before we left we had a lovely walk at the Saint Louis Botanical Garden one of our favorite places to visit. Hey Everybody! First, big thanks to all of who went to see "Bourne Supremacy" and/or bought the DVD. Because of the film's success, I have informed Aidan and India that they can expand their choices to include now both Junior AND Community Colleges! (We'll look into four year Universities after they sell the network rights). For any who want to see me catch the plague (yes, the plague), tune into NBC Friday, February 4th at 10p.m. (9 central) on "Medical Investigation." It's some pretty gruesome and intense stuff, so maybe shelter the kiddies. I won't give anything away, but the episode is called "mousetrap." Surprise ending. Try to solve the mystery. Also, some of you may have heard that I just finished filming "24" on Fox. It is a great show that will really hook you. This season is particularly intense. Lots of fun to shoot. Should air sometime in March. I'll keep you all posted. 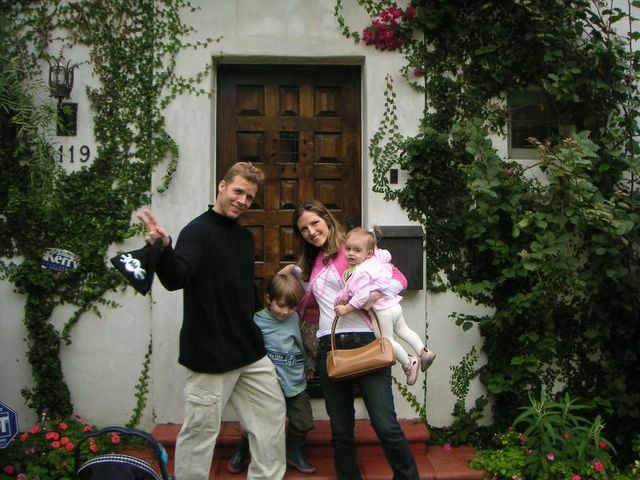 Happy 2005 from Tim, Alicia, Aidan and India!!! P.S. Congrats to all the new parents in the family!!! (Including big brother Andy!) P.P.S. Website with family pics to follow soon! Thanks to all the friend's who remembered my birthday last week. I share the date with Noel Coward, Margaret Mead, Beethoven, Arthur Clarke. This year we will be driving to St. Louis to celebrate Christmas Eve and Christmas Day with Andy, Catherine and Lulu. Hopefully we'll get out to LA to celebrate the Chinese New Year again with Tim and Alicia and Aidan. We hope to get the Halloween photos of India as a pumpkin and Aidan as Harry Potter up on one of the fotologs soon. Tim will be filming (a TV show) in the first weeks of January 05. For his children's college funds, he's asking that everyone buy a DVD of the Bourne Supremacy. (Yes, on the DVD if you go to the Director's comments part and watch his scene with Damon and phone conversation with Joan Allen you don't have to watch the entire scene. )Although we enjoyed seeing it immensely. We saw it with our friend Beverly Croydon who drove down from Santa Fe to see the little boy she used to know in Lake Forest turn into a CIA agent in a wink of an eye. Dunes for Thanksgiving at Tim and Suzys with all the Chicago area Griffins. They'll stay through the first week in December with us as Catherine's sister Mary Claire's son Gavin, born in October will be baptised in Chicago on the first Saturday in December. We'll be down in St. Louis for Christmas as Catherine and Andy's baby daughter is due the second week in January so they won't be traveling after the Thanksgiving week visit. Tim and Alicia and their kids visited us in Albuquerque for balloonfest. It was lots of fun and we enjoyed having them see Casa Griffin for the first time. Hopefully we'll post a few pictures soon. we'd like to include their Halloween shots. The West coast Griffins hosted a successful Halloween party. India went as a pumpkin and Aidan as Harry Potter. Tim usually sends us wonderful photos via his cell phone! They visited with us in Chicago for the Patel/Layland wedding over the July 4th weekend.Andy and Catherine came up as well for one of the most beautiful weddings we have seen (the bridegroom came on an elephant,the bride was indeed a princess bride, the wedding was on a boat, the wedding brunch was on Lake Michigan and the evening reception was at the Planetarium. And that was only half of the parties! (a henna party, another dinner dance and a bar-b-que in Grant Park) All the grandchildren were welcome so it was a very special few days together. we'll both travel back to Albuquerque where I'll celebrate my birthday a week early. It's been some months since I have been back to summer country. However, since it's summer I will post the two latest items of news from our family. First our second born son (Tim) and The Bourne and his small but viable role in Universal movieThe Bourne Supremacy with Matt Damen. He plays the role of CIA agent, John Nevins. Here are Tim and Alicia walking the red carpet at the premiere in Hollywood, a benefit for the University of California Film school-It's taken from hollywood.com. Since these links change often, maybe it will still be up, maybe it won't! Anyway if you see it, watch for his name in credits and cheer! And buy the DVD when it comes out, a shameless promotion for their children's college fund! And in the Great Good Fortune Continued department. 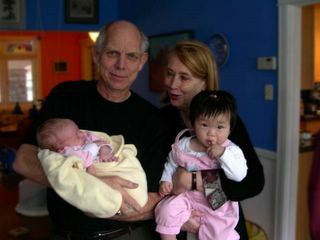 Andy and his wife Catherine have just been informed that their adoption from China has come through and they will be traveling to China in the next few weeks to pick up thier daughter Louise Catherine Griffin (her nickname will be Lulu which is in China is a lucky name and means double dewdrop). She was born August 22, 2003. Details on other summer activities, our most recent trips to Albuquerque and the wonderful weddings we have been attending will follow when I figure out how to post pictures to this blog. India and Aidan came in with Tim and Alicia as well as Andy and Catherine over the fourth of July weekend for the Patel wedding. To end this post in true synchornicity. I feel I should add that my godfather was William Casey, former Directory Central Intelligence agency. I don't think he'd like to see our son playing a CIA agent being bested by Matt Damon (Jason Bourne) but I think he'd applaud the fact that Lulu was named for my mother Louise Collins who died just before my third birthday. My father Peter Collins who died three months after my birth, worked for William Casey William Casey wrote me a wonderful letter about my father. I am still of course looking for it in my personal files.www.avalonarchives.com. As soon as I find that letter and also a charming letter where he once wrote "Dear Moira, thank you so much for telling me about your rabbit hatch". You can see that I was writing letters, even when I was young......................................... well of course I own the domain www.letterwriting.com! at what might change the Galapagos from the "economy of eternity"
wrote: It is difficult for the human enterprise to stand back from it's urgent agenda and see how the economy of the moment undercuts the economy of eternity"
islands, although we were in a smaller group.